I recently posted my daughter’s Cake Decorating Birthday Party, and mentioned that favors for the party included aprons that I made for each guest. 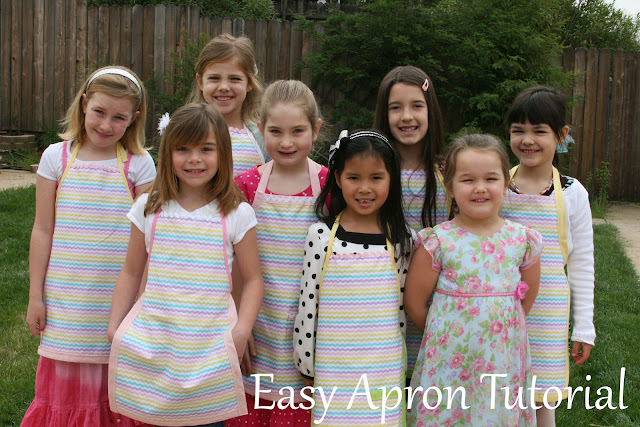 I loved how the girls all looked in the cute aprons, and the “pattern” (or lack thereof) that I used made these very quick and easy to assemble (sew). I was able to cut and sew all 8 aprons I needed in one day, and the supply cost for each apron was around $4.75, a price I thought was quite reasonable for a nice favor. If you have some very basic sewing knowledge, and a sewing machine, these are quite easy to put together. Most of the assembly process is “wrong” if you are an advanced seamstress, but for a project that I wanted to be very simple and quick, it worked great. Two packages (3 yards each) of Extra Wide, Double Fold (*make sure it’s Double Fold) Bias Tape, in a color of your choosing. You wont need to use all of both packages, but each apron requires more than one package. 1. Lay out your fabric, still folded in half, just as it comes off the bolt. *Note- the fabric I used was a total width of 44″ inches, so folded in half it was 22″. 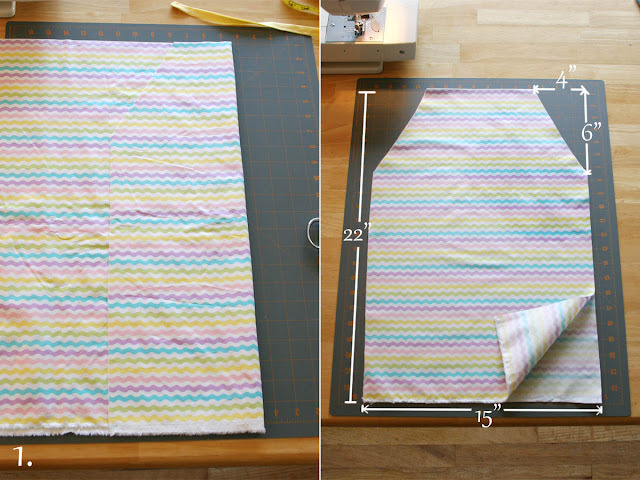 If you are using a larger bolt of fabric, you’ll need to make an additional cut to make the length of the apron 22″. Cut the apron shape as shown. First cut a rectangle 22″long and 15 inches wide. With each cut, you should have two layers of fabric back to back (wrong sides together) as shown. Once you have a rectangle shape, cut off the top corners as shown above, removing a triangle shape of fabric. 2. I used bias tape to enclose all the unfinished edges. Bias tape is long strips of fabric, pre-folded, usually sold near the ribbon or thread in a fabric department. Be sure to use “double fold” bias tape for this project. Cut strips of bias tape (in the color of your choosing) the length of the sides and bottom of the apron (as shown above). Cut as needed, leaving an overhang of about 3/4 inch on either side along the bottom strip. For these aprons I didn’t need to add bias tape along the top of the apron, because the fabric was folded (as it comes off the bolt). 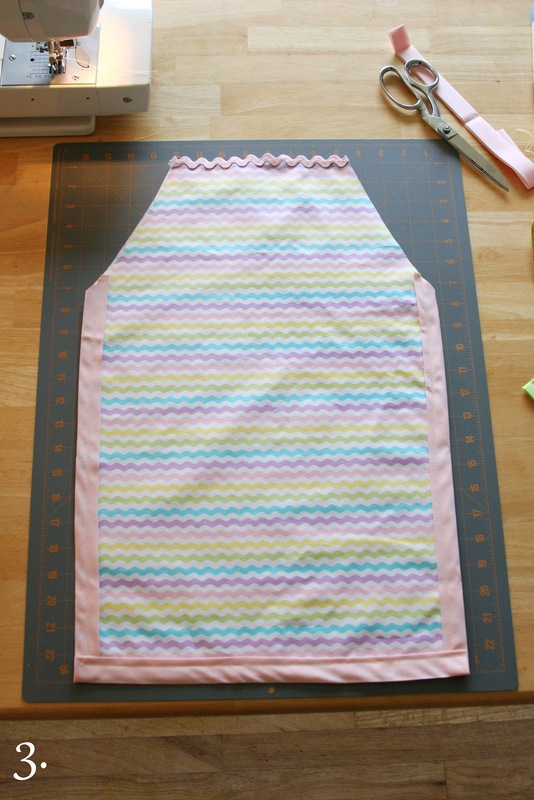 If you were using larger fabric and have an open edge along the top of the apron, you’ll need a strip of bias tape along the top as well. Note that the bias tape on the sides of the apron (at the arm pit area) needs to be trimmed at an angle (the same angle as the cut of the apron) as shown below. 3. Sew bias tape along sides of apron, opening up the fold of the bias tape (as show below in photo #4) to fully enclosed the unfinished edges of the apron fabric. When you have sewn the sides, sew bias tap along the bottom edge of the apron, folding over (or folding toward the back) at the ends. After this, sew a piece of rick rack (I used jumbo sized) along the top of the apron, as a decorative element. 4. Cut a piece of bias tape 46″ long. Mark the bias tape 15″ from one end. Begin sewing the bias tape together, to seal the fold (of the bias tape). 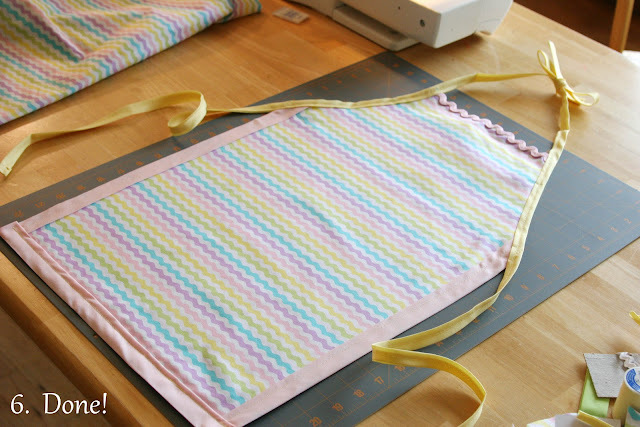 At the 15″ mark, insert the edge of the apron (as shown above), and continue sewing, now sewing the bias tape with the edge of the apron inside. When you get to the end of that side of the apron (the arm space), continue sewing the bias tape, now with out any apron between the tape (as shown below). Fold over the end of the bias tape to finish the edge (do this at both ends). 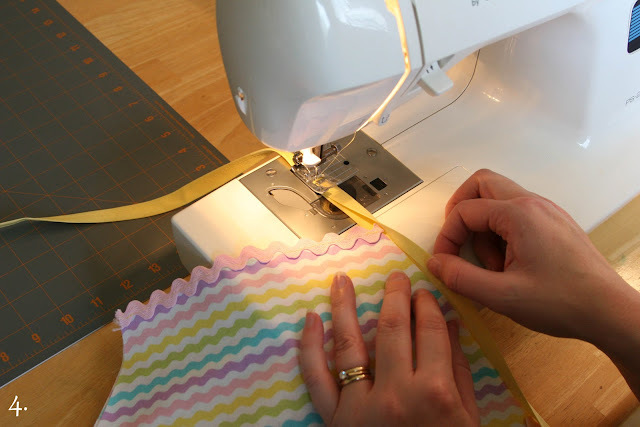 Repeat on the other side of the apron with another 46″ piece of bias tape. 5. Your apron is complete. All edges should be sealed and the ends of the bias tape folded over and sealed (with a seam). At this point feel free to add additional decorative detailing… a pocket, decorative button, a patch, etc. For my daughter’s party I made each apron a bit different, using different colors of bias tape and rick rack, and adding pockets to some. Iron the finished apron. 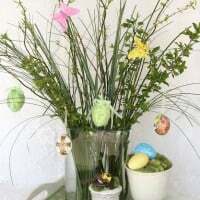 The fabric shown was Easter fabric from JoAnn’s. 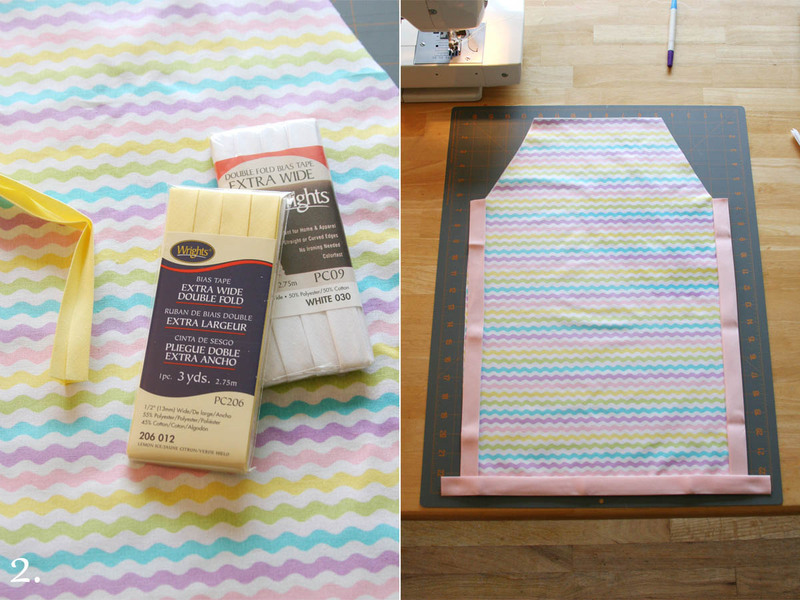 I bought it because it was on sale =) The price of your aprons will vary depending on what fabric you chose. This project can be done with any 100% (woven) cotton fabric. 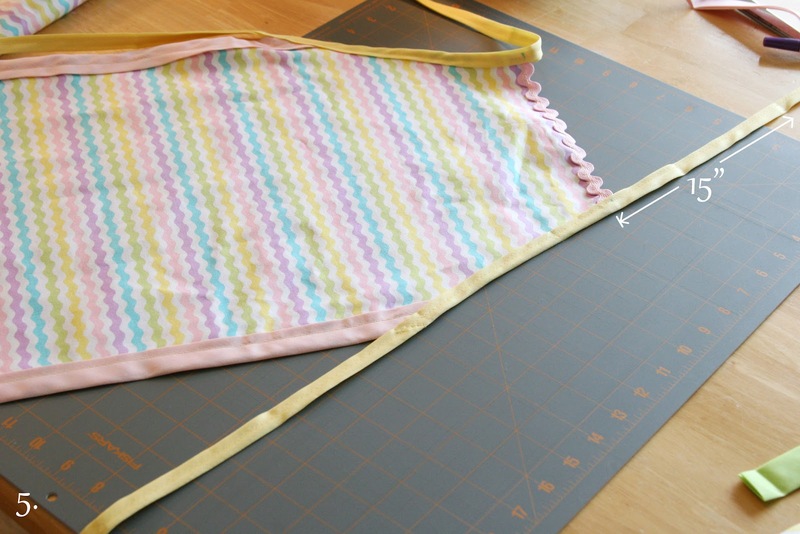 The dimensions I used for this apron were designed to fit girls ages 5-10. If you are making aprons for younger or older children, you may need to make some adjustments. 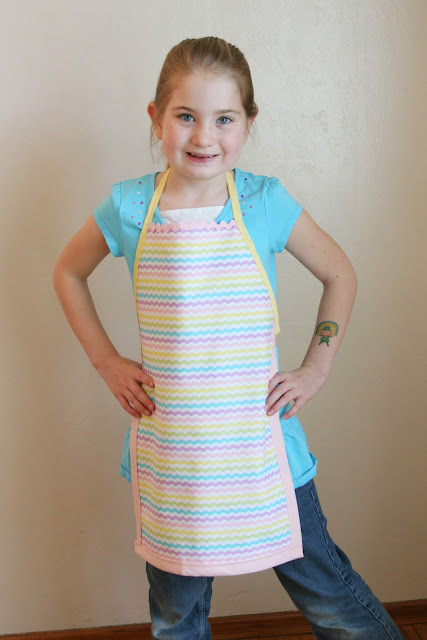 This style of apron would be perfect for boys or girls (depending on your fabric choice), for a baking party, gardening party, or art party, and would make a great gift for birthday’s or Christmas. This is definitely being saved for whenever I have kids. Thank you! I'll have to put this on our SUMMER TO DO List! Even though I'm NOT a sewer, I might be able to handle these aprons! Sophia loves her apron. Thanks again! That is super cute fabric! Great work Glory! Love you! so sweet and creative! can u make it one for me??? =D just kidding! Those are so cute. 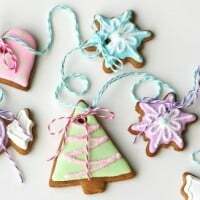 Thanks for sharing how to make them! 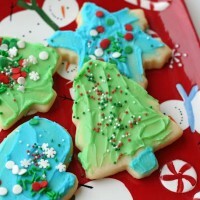 I love how simple they are to make and perfect for a party!! I REALLY want to make some aprons for for my munchkins(girls and boys)! Thanks Glory, for the great tutorial. It's perfect for a beginning seamstress(I was going to put "sewer", but that didn't look right:)) like me! Great tutorial Gloria!! I'm sorry I didn't get to the Spring Fling to meet you…I read your blog all the time. 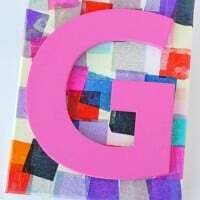 This is a perfect idea for a little girl's or boy's party!! If my daughter were younger(she is now 18)I would be making these for her birthday party in May!! These are too cute! Thanks for the instructions. Adorable aprons! Now if I could just get the sewing thing down! Muy bonitos los delantares y preciosas las modelos. Bss!! Sew Adorable Glory!! Thanks for the tutorial! I think I might steal this theme for Adison's next party! LOVED how simple yet CUTE it was! What would my party life be without you??? So cute!This is a great idea for rainy days.Thanks for sharing.